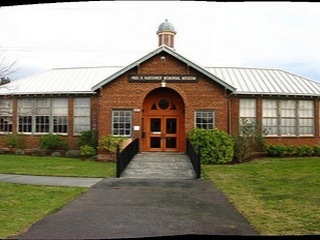 Having tragically lost a son, Dr. and Mrs. Warner M. Karshner founded the museum in 1930 as a tribute to their son, Paul H. Karshner, who was at the time, about to start his senior year at Puyallup High School. Over years of collecting pieces for the museum, in 1935 the Karshner family donated the collection to the Puyallup School District. The museum remains close to its school district roots, not only sharing Stewart Elementary “campus,” but also by integrating part of it’s collection with the curriculum of the district. What better way to learn about the NW Indians but to visit “your own” district museum? The Karshner Museum is a terrific resource for every student in the district, and every family in the region. The museum includes collections of fossils, rocks and minerals, wildlife, sea life, microscopic slides, artifacts by North American Indians and fro the South Pacific, Alaska, South Africa, Nigeria, India, Philippines, Japan, China, Mexico, and South America. Students view and study the collections in ever changing exhibits, many of which invite the children to touch. In addition there is a fine museum library of rare books and magazines, maps, documents, photographs and original manuscripts. The collection of more than ten thousand artifacts donated by the Karshner’s has been added to over the years by members of the community who have identified with the museum and donated their own collections, artifacts, and specimens. Some highlights: an oil lamp from 300BC., a stone point used 30,000 years ago, a Northwest Costal Indian basket display, artifacts from our earliest Pioneers, or walk into classroom set up to appear as it was 100 years ago. There is so much to see in so small a space, so check back often, as only about 20 percent of the collection is on display at any one time. Not only is this museum excellent, but so to is their website. Or, make sure to bring your family to one of the open houses during the first Saturday’s of the month, where your family can explore the museums wonderful collection.